The post Tiller Review: Spreadsheet Budgeting Taken to the Next Level appeared first on Club Thrifty. In this Tiller review, we’ll explore how you can use the program to create a budget, track your spending, and run reports for your taxes, and more. Enjoy! You already know that tracking your spending is the first and most influential step when it comes to organizing your finances. Maybe you’ve even created your own spreadsheet to monitor your budget already. As you’ve probably found out, though, the process of adding each transaction and updating your balances is time-consuming. There are tons of budgeting apps out there, and many of them make budgeting easier by automatically importing data right from your bank account. Still, even the best budgeting apps are limited in how you can organize your financial information. Tiller is designed to automatically import your transactions and transfer the data directly into Google Sheets. Instead of manually entering your financial data, Tiller connects to your bank accounts, syncs your income and expenses, and organizes everything with a spreadsheet. It’s working so well that soon it will sync with Excel workbooks, too. With no advertising and ultra-customizable templates, Tiller builds on using the power of spreadsheets to take your money to the next level. But, is it worth it if you don’t already love spreadsheets? Let’s find out. Get a Month of Tiller FREE – Simplify your finances with Tiller! Use their preformatted templates or build your own spreadsheets from scratch. Just connect your accounts and let Tiller take care of the rest. Try Tiller for free here! Tiller is a personal finance tool that makes managing money with a spreadsheet easier. It syncs the financial data from your bank accounts directly to a spreadsheet, saving you from having to enter it by hand. It’s geared toward people who prefer to be more hands-on than what some of the other financial software out there allows. In addition to spreadsheets for budgeting, debt, and net worth, there are also spreadsheets for small business owners. These are great if you’re running a side hustle because they sync your income and expenses, making things easier when tax time rolls around. It comes with spreadsheet templates, but you also have the option to set up customized sheets to fit your individual money goals. Tiller can pull transactions from several different accounts into the same page for a central place to organize your spending. It also supports separate sheets at the same time, so if you want to use a different sheet to display different accounts, you can do that, too. Tiller is ad-free, and there is a cost involved to use the service. It comes with a 30-day free trial, giving you time to test it out before you subscribe to it. That way, you can see how you like it compared to other budgeting software you’ve used. If you’re a student, you get the advantage of signing up for their Student Plan. As a student, you can use Tiller for an entire year without paying anything. For everyone else, you’ll pay a subscription fee of $59 a year after your 30-day free trial. Considering that works out to less than $5 a month, it’s a pretty darn cheap solution for getting your money straight. You don’t pay until the end of the trial, and you can cancel at any time. Tiller imports your spending, income, and account balances to a spreadsheet so you can see your finances in one place. Below are the customizable pre-made and “build-your-own” templates you can use. This is the default spreadsheet Tiller uses to get you started. It comes with a five-step checklist to walk you through setting up the template and will begin updating your daily transactions right away. With the Tiller Monthly Budget template, you can see your spending at a glance on the Budget Dashboard. When setting it up, you have the option to add customized budget categories and set up a time period to monitor your income and expenses. The most common is a monthly budget, but you can set it to weekly, bi-weekly, monthly, quarterly, or another custom option, too. 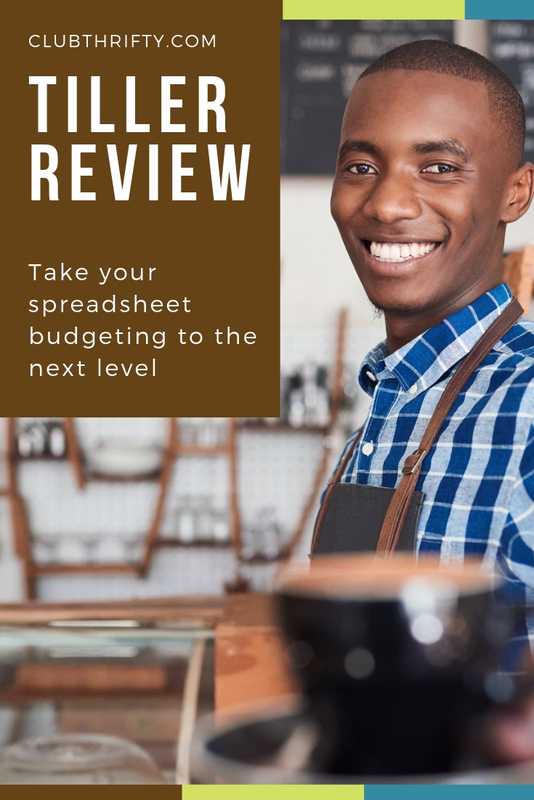 If you have a specific budgeting method you like to use, such as zero-sum budgeting or the envelope system, this spreadsheet has the features you need. We’re big fans of the zero-sum budget, and Tiller makes it easy to budget every dollar across as many categories as you need. Just like the Tiller Monthly Budget, this template allows you automatically import and categorize your income and expenses. There are shortcuts on your Budget Dashboard so you can move money from one category to another, and you have the option to pick custom periods to track your budget, too. Sticking to a budget isn’t always easy but the Weekly Expense Tracker automatically syncs your daily financial transactions for you. It lets you create personalized categories to spot spending trends and curb impulse purchases. Tiller’s Weekly Expense Tracker shows you at a glance if your spending habits match your financial priorities. Often, you don’t realize just how much money you’re spending on food and entertainment, and seeing your expenses in black and white is the first step to creating better money habits. This is also helpful at tax time. By tracking your expenses, Tiller can also run an annual report of your spending by category. Just run the report, print it off, and use it as needed. Tiller helps you get organized to pay off your debt by creating a concrete plan with the Debt Snowball template. If you prefer the debt avalanche method or another custom payoff plan, you can switch to using those instead of the debt snowball. Whichever strategy you pick, it automatically syncs your daily balances into the spreadsheet and helps you target one debt at a time. It works with credit cards, car payments, student loans, mortgages, and more by mapping out how much you can pay toward each to finally get debt free. As a bonus, it includes an email series to help motivate you to keep working toward your goal. Managing the financial aspects of a small business or freelance operation is no small feat. With Tiller, you’ll monitor business expenses, cash flow, and have the ability to generate profit and loss reports to keep you organized. The Small Business & Freelance template imports your transactions automatically to update your ledger, and you can see available balances and reconcile your bank statements, too. When you’re self-employed, you’re generally required to pay quarterly taxes. If you don’t have an employer that withholds Social Security, Medicare, and income taxes for you, the IRS provides form 1040-ES for you to determine what you might owe. The Quarterly Tax Sheet saves you time and stress by automatically calculating your tax liability. You can see real-time projections of what your tax bill might be for each quarter using the real-time financial data from your business. Knowing your net worth tells you exactly where you stand at this very moment. When you compare the value of everything you own to the amount of money you owe, you can see if you’re on the right path to building wealth or on the fast-track to more debt. With the value constantly changing, Tiller’s Net Worth Tracker will sync your account balances automatically, giving you a clear picture of your financial health. You’ll have everything in one place to see your progress toward meeting your goals. For a more hands-on approach to managing your money, Tiller has a Build Your Own template option. Starting from a blank canvas, you can create a completely customized spreadsheet that will auto-import your daily financial transactions just like their pre-built templates. If you like more control over your finances or want to experiment with making a spreadsheet that’s tailored from top to bottom, you can use this option. Tiller will take care of the formulas and calculations, and you can focus on the data that matters most to you. Automation lovers – If you like automating your money to track and categorize expenses, Tiller is a great option. Your income and expense transactions are imported automatically, making it easy to set up and use. Using your synced data to update the Budget Dashboard and Net Worth Tracker, you’ll easily know the status of your finances. Budget junkies and spreadsheet nuts – Budget junkies who want more control over their money can use it to take their spreadsheets to the next level. There are so many customization options to consider, and you can use the Build Your Own template to create a new spreadsheet for an intuitive and personal experience. College students – College students can take advantage of the Student Plan and have complete access to all of Tiller’s features free for one year. The Weekly Expense Tracker helps to keep spending under control, and you can get ahead of debt and see where you stand by tracking your net worth while you’re still in school. Those without Google accounts – If you don’t already have a Google account and don’t want to create one, Tiller might not be for you. The program uses the power of Google Sheets for its spreadsheet templates, and you’ll need a Google account to get started. Spreadsheet novices – To get the most out of using Tiller, you should have a little knowledge about working with a spreadsheet. Even though the process is automated, you’ll need to know how to read a spreadsheet and be able to understand your information when presented that way. If you’re a fan of budgeting with spreadsheets, Tiller is a no-brainer. With Tiller syncing your daily financial transactions to Google Sheets, it does all the data entry for you. That way, you can focus on your money goals – like spending less money, paying down debt, following a budget, and building an emergency fund. For those who are new to the idea of using a spreadsheet and want to give it a try, you can start with the premade templates. You also get a 30-day free trial to decide if it’s a good fit. Either way, it could help you get your finances organized and take your budget to the next level. Try Tiller for FREE – Want to take the stress out of tracking your finances! Automate your financial tracking with Tiller! Try Tiller FREE for 30-days here.